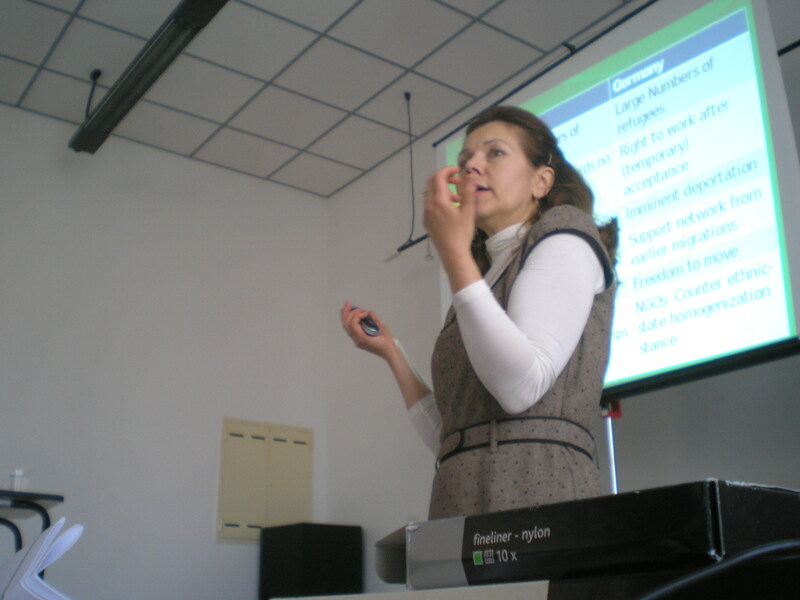 The last blog described the ending of the first day of the course at the Inter University Center of Dubrovnik. The participants went back to the hotel to have a drink and dinner. After the dinner the preparatory meetings for the presentations of today took place. Throughout the hotel there were groups of participants and resourcepersons talking about the content, title, strengths, weaknesses and length of their presentations and workshops. After these informal preparatory meetings we all sat down to relax and to enjoy the beautiful city of Dubrovnik! Today started at nine o’clock with Paul Stubbs’ presentation on the new generation; the children. How does the financial crisis influence poverty among the children, especially in the so called eastern Balkan. The financial crisis hit the Central Eastern parts of Europe and the Former Sovjet Union countries the hardest. In the past decades Europe has faced crisis, conflicts, transitions, reforms, growth and again crisis. Why the focus on children? They are the future voters, they are the future politicians. Thereby, growing up in poverty has high individual costs and it doesn’t provide equal opportunities for all children. For example, the acces to pre-primary school. Rates show that there is a gap between children living in poverty comparing to rates of total population living in poverty. There is also the urban-rural dimension that shows huge differences between children living in poverty. Also there are many concerns about the quality of the education and the buildings of the school. The crisis leads to increased informality and importance of subsistence economy. Do you want to invest in your 15 years old child to go to high school and university? Or do you need him to work on the land? Short term decisions have huge effects on ‘the long term picture’. What is the solution for the child poverty? We need to develop social protection systems that provide sustainable social reproduction, integration and cohesion; some kind of social pattern for everyone. With minimal income guarantee, early intervention, acces to quality services and equalized opportunities. After a short coffee break at the nice café Sesame the participants could choose between two workshops. One by the consultants from Hiemstra en de Vries; their workshop provided the participants with a case study with different stakeholders, the goal was to come up with an advice and to create some kind of paradigm or mentality shift among the stakeholders. The other workshop looked into the future of the European Union; what should it look like? Will it still excist? How many countries are a member of the EU? How do the make policy? Is there a European Law? The participants presented their interesting and challenging vision on the future of the European Union. 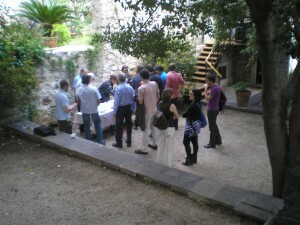 During the well deserved lunch break the participants spread throughout the city of Dubrovnik. Having lunch in the nice and warm sun, the participants talked about the first lecturers of the morning session and their impressions on the course so far. After the two hour lunch break the participants and the resourcepersons were activated and motivated to start the afternoon session of the course. Ana Devic started the afternoon session with a lecture on Multiculturalism and New Regimes of Exclusion. The lecture started with a research on the differences between strategies and reception of return to Roma’s between the United Kingdom and Germany. Ana showed the group several differences between the countries. For instance, in the UK the Roma’s are not allowed to work and don’t have the freedom to move. However, in Germany the Roma’s have the possibility to find a job and contribute to the society. In general, the research focus on the exclusion of a minority, those who are underprivileged, within a specific society. Ana presented a theoretical framework about the shifting definition of ‘the underprivileged’. In the past the underprivileged were the unemployed welfare clients while nowadays the definition switched to active, but poor, workers. The aim of the lecture was to step outside the paradigm of the majority; try to look at this topic from a minority point of view. Nowadays multiculturalism is a hot topic, there is a lot of writing going on about this topic. But what happens with all these papers? How do we make the transition from paper into practice? That is one of the challenges Europe is facing in the future towards policymaking on exclusion topics. This first day ended with the forum debate on the challenges of a renewed Europe. The forum was chaired by Wieger Bakker, fuelled by Paul Stubbs and joined by Ana Devic, Frans van Waarden and Gordona Matkovic. 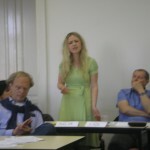 The debate focused on the situation in the so called western Balkan states and the enlargement of the European Union. Paul thinks that there are geographical, tactical and moral reasons to choose for a membership of the European Union. But it is often been brought that the Balkan wants to join Europe, but Europe also needs the Balkan! During this session there was a constant journey of discovering Europe’s nature; where does the enlargement ends? Does it ends? 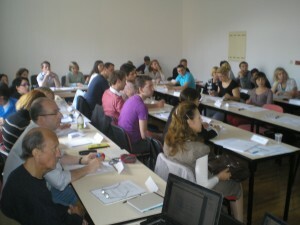 The first day of the course was a day filled with new impressions and interesting lecturers by the resourcepersons. The participants were actively involved in the discussions after the lecturers. We are really looking forward to the coming days of this course. Due to the ashcloud that closed a lot of European airports for several days the 2010 course started two days later than planned. Wednesday at 17:00 hours the Dutch group finally arrived at Hotel Lero in Dubrovnik. The Czech, Macedonian, Croatian and Ukrainian delegation arrived some days before. The participants and resourcepersons met each other for the first time on the terrace of the hotel. Combined with a glass of beer and a nice warm sun the participants and the resourcepersons got acquainted. Wieger was grateful to finally open the course on Thursday and to welcome all the participants and the resourcepersons at the Inter University Center of Dubrovnik. A year ago we thought the theme ‘Changes in Crises’ might not be relevant at this moment; maybe the crises was all gone. But, luckily for the Dubrovnik Course, the Crises still exists. For the next three days students and resourcepersons from all over Europe will talk about the chances and challenges for Europe provided by the crisis. Bart van Steenbergen took the group on a journey into the history of the course ‘Inclusion and Exclusion in Contemporary European Societies’ and the relationship with the Inter University Centre of Dubrovnik. The course emphasizes the informal contact between professors and students; therefore they are called ‘resourcepersons and participants’. The professors are resources, they are lemons filled with knowledge that need to be squeezed out by the participants. 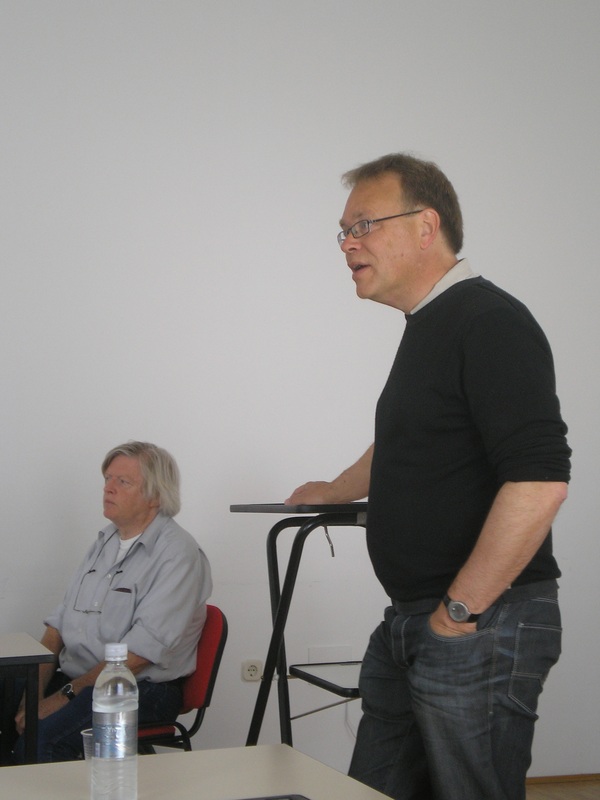 In his lecture, Bart showed two relatively new sides to analyze the crisis. One was the aspect of feminization; Would the financial crisis not have taken place, or more less, if there had been more women in the top of the financial world. Would it look different? The majority of the group disagreed with this thesis because of several reasons; for example, it was the financial system itself that promoted risk taking and greediness. 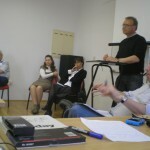 The second subject of his lecture dealt with language within Europe and turns the group participants into a group of policy advisors for the European Commission on Language. All Europes should speak one foreign language, Bart suggests. Therefore Europe can cut budgets on governmental bureaucracy; there will be no more translators needed in Brussels, which will reduce the bureaucrats in Brussels by one fourth! 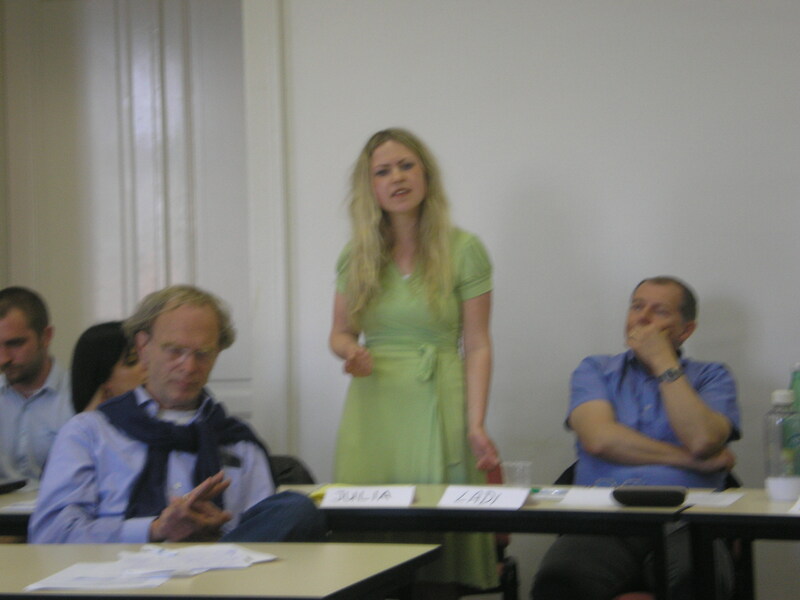 The group agrees with the policy advise that every European citizen should at least learn two foreign languages. The language is an important expression of the identity and culture of the different European nations. With bi- or trilingual citizens the deeper understanding of diversity of the European cultures will be understood. 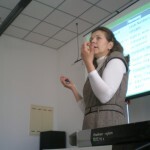 The next lecturer was Brigitte Unger. She raised the question whether Europe is diverging due to the crises. We are just facing new old problems in the shape of unemployment and public dept. The financial world became five times bigger than the real world; more and more investments in the (non-existing) financial market instead of investing in ‘the real world’. During the crises a lot of measures were taken to overcome the crises. For example, Easter Europe countries received a lot of investments from IMF and the EU but none of them touched the real side of the crises; inequality. Investing in the financial market is investing in a bubble, that sooner or later will burst again. There is a certain corridor in which economics have to develop, currently we are outside this corridor. Crises also brings up the discussion about public dept; especially the size of the public dept. The measurements took to decrease the crises did not reach the deeper causes yet. There is a danger of a new bubble, a new crisis. The financial stability is a public good and we need to arrange a world financial organization to develop legislation to control the financial market and to stay within the corridors of economic development. 15.00 – 16.15 No place for my name? Kosovo Roma’s Transnational movements and deportations in the European Union.